That's right you foul-sundered, fickle lovers of DC Comics. Once a year we have to appease those truly horrid spirits of Halloween, commemorating their bitter souls and rancid vestiges of life to the sanctity of honor and peace. After all, they don't call it Dia de los Muertos, "The Day of the Dead", for nothing. 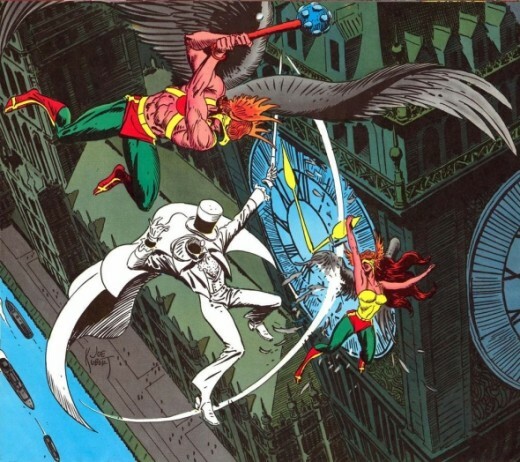 Left: DC's Spirit of Vengeance, The Spectre. What? You're scared? Ghosts and goblins send you screaming into the night? Well, don't go there! Just sit down and take a load off; from this article you're going to learn about those sickly beings, some possessed and others lacking a wit of soul. Writhing in the near darkness of a hallowed eve, you'll also spot their empty husks, those of patch-worked and mismatched flesh. Within this list dwells deep magic of the macabre, the top 12 spirits of DC Comics, an introduction to their most phantasmal, cursed, and zombie-struck superheroes and villains. While best undertaken on a dark and spooky night, this grimoire of haunting characters will easily fit the mood of many comic book readers looking for a chilling perspective of those unfortunate beings. Taken from a 19th century English nursery rhyme, DC Comics raised the ire of the first Green Lantern, Alan Scott, when he encountered their first zombie super-villain, Solomon Grundy (All-American Comics, Oct. 1944). Pale white of skin, interposed with the vegetation of the swamp as his resting place, we realized Solomon was extremely more difficult than your average foe, mainly because he can't die. And actually, we're not really sure if he has a soul anymore. 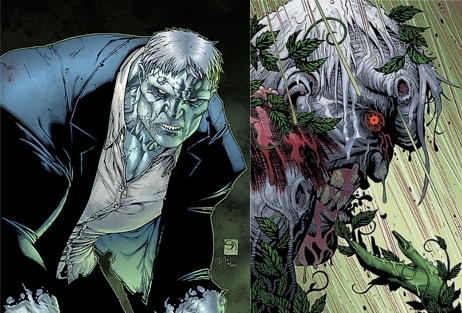 As DC Comics have evolved over the decades, it has been explained that Solomon Grundy, formerly a rich businessman named Cyrus Gold, was either murdered or took his own life. Somehow his corpse ended up in the Louisiana Bayous, infusing with the flora and taking on the aspect of a partial plant elemental. When he rises, he is virtually mindless, incapable of remembering most of his past. Therefore, in truth he's likely a part plant-zombie; as the superheroes of DC have encountered this cursed creature over time, they've noted that he returns, freshly mended (as far as corpses go), after every defeat. And coupled with the strength of Superman, Solomon Grundy has made them all fearful of the power of the undead awakened. Solomon Grundy and Cyrus Gold - An Adventure from the Swamps. If you're looking to get an in-depth observation of the Solomon Grundy curse in DC Comics, this paperback has it all, written by Geoff Johns (also notorious for his work with The Flash). One of the great super-villains of the 20th century, you're about to undertake an adventure that actually teams Grundy with his previous incarnation. Yes, it gets strange, but the beauty of this is that you'll also learn his origin. In this macabre graphic novel, you'll get Solomon Grundy interacting with a multitude of characters such as Killer Croc, Bizarro, The Green Lantern, and many more. This is a huge item if you've been wanting to get a detailed origin; that's because Cyrus Gold and Solomon Grundy are both on an adventure to remove their curse. How can that be, you say? Pick it up and you'll find out! Born of the muck and matter of the dismal swamp, most of us who read DC Comics know the dreaded Swamp Thing as a plant elemental and force of nature protecting his domain by an affiliation with The Parliament of Trees. But to the few that probe even deeper, he is also the retainer of memories and psyche of Dr. Alec Holland, a biochemist who died long ago in the swamplands. For many years, we believed Swamp Thing actually was Holland; he first appeared as Alex Olsen in House of Secrets #92 (July 1971), escaping a bomb-explosion with deadly injuries that knocked him unconscious. 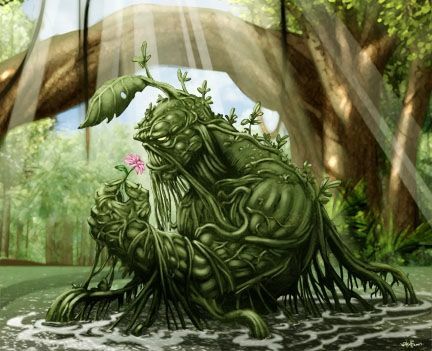 When he awoke, his body had mutated, fusing and healing with the heart of the swamp, becoming a green monstrosity. It was only in the last 10 or so years that we found out the truth, that somehow the plant had absorbed everything, thinking it was once the man. But then what we thought we knew changed again in the DC Comic event Brightest Day, where Swamp Thing became corrupted by a deathly forced called Nekron. During that epic storyline, Alec Holland was finally raised from his grave to bond with a new creature championing the white light. Becoming the true Swamp Thing, he battled the evil version and reassumed the mantle as a swamp creature housing the soul of an innocent man. It came from the swamps. - And dirt, grass, and moss. 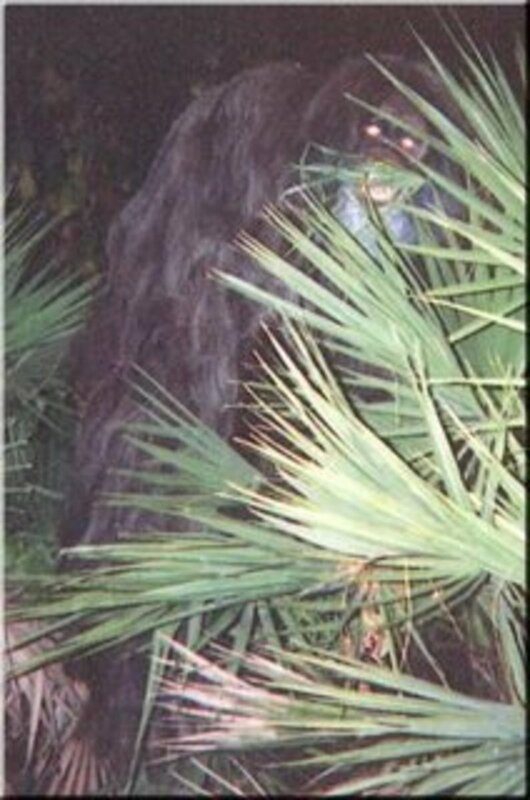 Many people believe that Swamp Thing was created by Alan Moore (formerly known for his creations The Watchman and League of Extraordinary Gentlemen), but that's not entirely true. While Alan Moore did do a lot of the authoring for Swamp thing, it was originally the invention of Len Wein and Berni Wrightson. Regardless, it was Moore who started the story arcs and development that made the creature extremely popular. The first volume of Swamp Thing covers 8 issues of his original title as it was released in the 80's. (Swamp Thing vol. 1 #20-27). This is where Alan Moore took over the reigns and built the great stories surrounding the plant elemental. 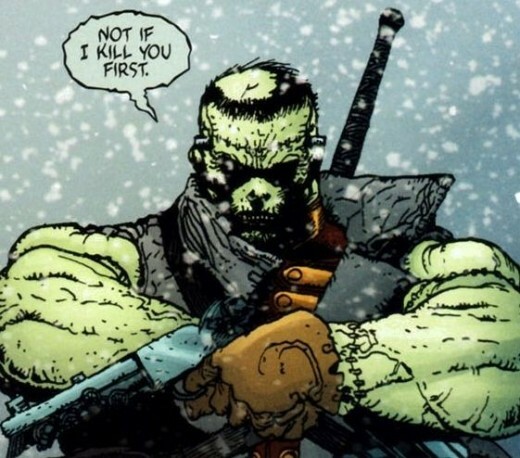 DC Haunted #10: Frankenstein - Is this poor wretch a friendly hero? If you're a cursed spirit in the DC Universe, the chances of coming out of it with good looks and bronze skin are slim. Sure, it can happen from time to time, but don't count on it. And if your soul is a nasty compilation of mixed-up parts of human flesh sewn together in some mad scientist's laboratory, just throw in the towel. That's right; give up on being called "Handsome" because your name is probably Frankenstein. Based loosely on Mary Shelley's interpretation, DC's Frankenstein is more akin to the Boris Karloff version of the 30's; he still wears all the stitches and stands well-muscled above the heads of most humans, shown mostly in pale-grey or greenish-hued skin. And while Karloff said little to nothing, this one vocalizes his anger, telling you the problem. The only surviving experiment of his kind, Frankenstein showed us that he was more than just brawn and accursed undead. Soon during his adventures he equipped himself with the longsword of Michael the Archangel and a powerful steam-driven pistol, making him a deadly opponent at melee and long range. Later, he would join a special operations organization named S.H.A.D.E. giving him the ability to draw from their information database and detect and discern evil. Frankenstein and a Monster's Reunion - ...with the Creatures of the Unknown. In the recent Flashpoint DC comic book event, Frankenstein was teamed up with inhuman and monstrous soldiers created in the 1940s to stop Hitler and his hordes of Nazis. Their story takes place in present day, when their containment units are broken, returning them to life. In this series, you'll get a taste of the horror classics with a DC superhero twist. Velcoro, the blood-thirsty vampire; Griffith, the wildly berserk wolf-man, and more. The original Frankenstein and the Creatures of the Unknown series was released in 2011 concurring with DC's Flashpoint event. 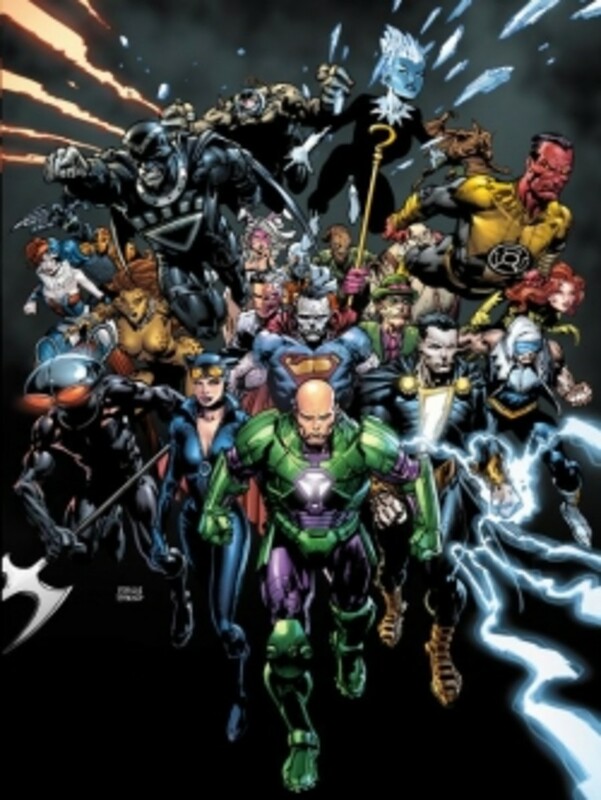 It spans 3 issues and ties into a whole host of comic books surrounding The Flash, a world with a new reality, and the reboot of DC comics corresponding to "The New 52". One of the first things that may confuse a casual observer about Raven, the only name she had ever been given ("Rachel Roth" was just recently adopted), is her appearance. She looks like a normal, comely teenager with black hair and an affinity for dark clothes. She seems normal as well, speaking fairly calm and controlled. She even gets in relationships, breakups, and arguments you'd associate with a typical human girl. But she's not typical; haunting is a more appropriate word. "Cursed" could also be used; it all changes once she loses control. The product of a human mother and demon father, Raven was originally raised in a dimension called Azarath and taught to gain mastery over her emotions or suffer the consequences. Her destiny is clear; control your tainted soul or you will be overwhelmed with the demonic spirit raging inside. 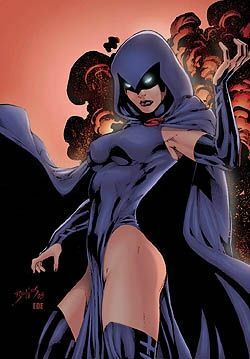 Ever since her first appearance in DC Comics Presents #29 (October 1980), Raven has been heavily linked to the Teen Titans (also called "Titans") and their adventures. She has been destroyed at least once, to save Azarath, and has been documented as a wandering soul without a corporeal body on other occasions. Clearly, it's her soul that keeps her tortured incarnations from finding peace. To date, she's assumed three different forms, all of which eventually have ties or inclinations to evil. Released by Mattel, this is a complete, fully-posed Raven figure and one of a huge line of the "DC Classics Universe". Some of the other products available are Kyle Rayner, Donna Troy, Martian Manhunter, Joker (All-Star Version), and The Spectre. 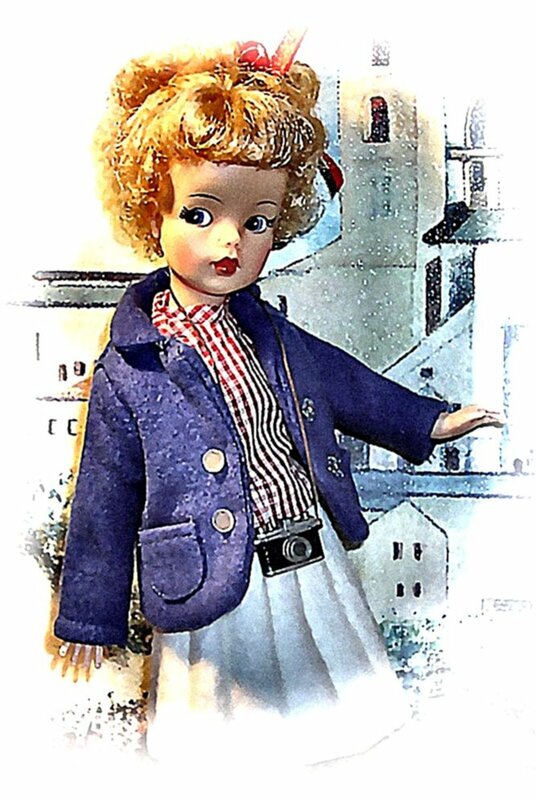 Checking out the link here because there's numerous choices, making a great part of your collection. Part of the DC Universe Classics Line, Raven is one of many figures that scale approximately 6" and has 23 points of articulation. It is not the White version of Raven, and the hood does not come off to reveal her face. Great collector's item and you can also follow the link to find more of the other superheroes involved in the line. You can also complete the entire Teen Titan's set. As long as Earth's history has plagued us with accounts of ghosts, goblins, and malevolent spirits, we have also been provoked and disturbed by the possibility of possession. Such is the terrible torments of the soul when a demon enters your host, taking control of your actions and working its plots. That is where we find the unfortunate soul of Jason Blood, one of King Author's knights. Known as an immortal solely for that reason; his life would end as a mortal should he rid himself of his curse. But as of yet, it is not to be. When consumed by anger or rage into uttering the summoning incantation, Jason is overtaken by the son on Belial, the demon of hell known as Etrigan. Hunched over like an elder man, with mottled orange skin and crimson-hued eyes, this creature is a spawn of the damned, violent and willing to undertake great savagery against his foes. 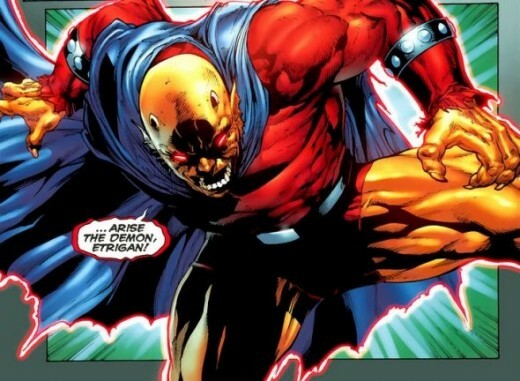 For some explained reason, though, Etrigan has worked for the forces of good more than evil. Even though he is said to have gained much authority and title in the lands of Hell, this entity aggressively combats other bad elements; it is believed that Jason Blood's curse somehow directs the creature towards indirect benevolence as part of their supernatural struggle. Change, change the form of man. Free the prince forever damned. Free the might from fleshy mire. Boil the blood in heart of fire. The Demon ran back in 172-1974 and spanned an entirety of 16 issues. To those of you who are big Jack Kirby fans, that era of Comic Book ingenuity has passed; luckily, though, you can capture the who story in this Graphic Novel. It sets a story of its own, without any interactions of the normal superhero population. 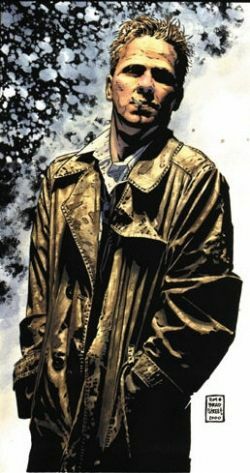 Under the guise of Hellblazer, John Constantine has to be one of the most tormented souls of all DC creation. It might be surprising to say this because there's nothing truly unique about this British born man with average to low skills in sorcery and demonic summoning. The problem is, he really makes those creatures of the infernal pits go mad. So mad, that Hell had plans for John's soul; he was, and technically still is, a doomed man. (Over the course of his adventures, he learned this through the encounters of any number of ghosts and wrestless spirits, telling him how dire his existence would be when his mortal frame expires.) And to make a wrongful situation worse, he had lung cancer, a certain, painful death to come. What makes John special, even with a spirit damned by demons, is that he's currently managed to keep his soul above water. To hold off Hell, he sold his life's essence to multiple demonic lords. The effect, when these underworld beings learned of the trick, caused John to be healed of his cancer; they decided they couldn't let him die because it would start a war in Hell. Because of his cleverness, John Constantine remains alive, but dances on mystical pins and needles. His first appearance was Swamp Thing #37 (vol. 2, 1985) as a youthful spiritual advisor to that monstrosity; later he developed a much more cynical taste for trouble and has walked the Earth a cursed being ever since. In this story, John get's tasked by British Intelligence to determine a mystical connection to events in Iraq. He then goes in and things turn quite magical and heavily bent on damnation. In the end, the main culprit is a babylonian god, looking to get some exercise from all the death and violence. What will attract readers to this book is that it adheres to a strong, angular, interesting moral compass that's drawn fans to Constantine in the past. Released in 2010, this book turned out to be really successful because it integrated a unique character into the current event of Operation: Freedom and the Afghanistan and Iraqi wars. Putting a twist like this on it, made it ring closer to home. 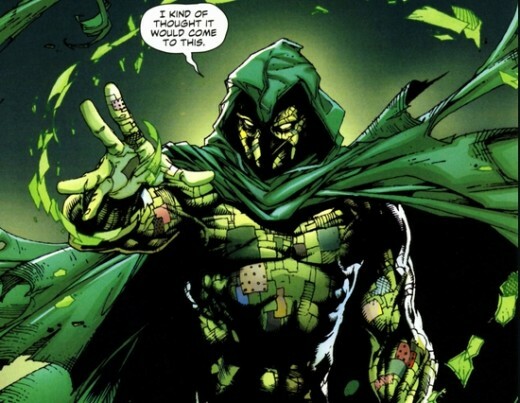 DC Haunted #6: Ragman - Sometimes the costume IS the curse. Rory Regan, aka Ragman, with a suit of cursed souls. 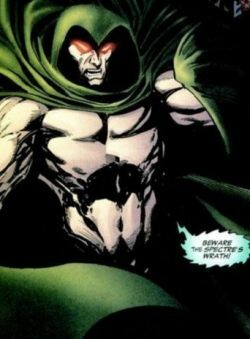 Of many of the despised and wicked souls within the DC Universe, none quite have the badge of honor that Rory Regan, also known as The Ragman (appearing first in Ragman #1, 1976), have come to bear. 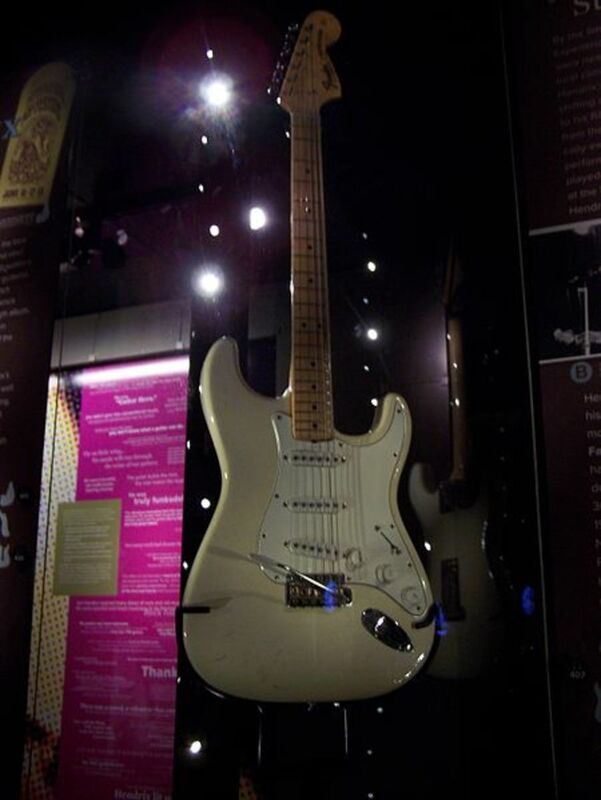 Born within the Jewish faith, he only learned sixteen years later of his heritage; shortly thereafter, his father was murdered in a "rag" store by drug pushers. Rory, you see, has no evil in his heart; technically, his soul is at peace. His destiny unfolded when he returned to the store; instead of liberating it, he found a chest with a pile of rags. Instead of wearing them, they wore him. But that's not the problem when you are a superhero of Jewish legend; to be Ragman is to wear a suit composed of patchwork cloth. Those square pieces are the source of his abilities. And knowingly to Rory, each thread binds the soul of an evil person! Ragman, therefore, is a creation of good and a source of inspiration and freedom to those who are just and live a rightful life. What makes others tremble in his presence is that his powers are fueled by evil souls. If you should be one of those unfortunate and maligned people nearing him, he will draw your spirit within him and you will be another patch on his suit. In 2010, Ragman appeared in a one-shot episode that put him in a philosophical spin. Having never understood his father, he goes to a Rabbi for mentoring and understanding. This is the collection of one issue: Ragman #1: Suit of Souls. It's brilliantly drawn with a compelling story about Rory Regan, a guy searching for understanding to his father's bizarre past. Why didn't he acknowledge his faith? Why did he leave Europe? All these things begin to make sense as Rory goes to the one place where answers can be found: within the suit! Born in the 18th century, James Craddock was nothing; a lowly highwayman spurned into world of preying on weak passersby. Coming from poverty, a life of crime was all that he knew, eventually taking his spree to the United States. Well, that is until a fateful day when legendary gunslingers Nighthawk and Cinnamon killed him. From that point, his (un) life was forever changed; the ringing words of the gypsy which prophesied his fate became unerringly true. He looked dead; but no, his spirit could not rest and from thence he rose to become the super-villain we know as The Gentleman Ghost. Craddock, to this day, is unable to die and we've learned that the source of his "immortality" is none other than his exposure to the Nth Metal of Thanagar, which resides in the hands of Hawkman and Hawkgirl. In other words, the people that killed him long ago were none other than reincarnations of those winged superheroes commonly called "The Hawks". And the same mysterious metal which reincarnates them every new generation also keeps Craddock alive and in his cursed state. So there is his curse; for him to die Hawkman and his mate must also perish; while they continue to become reborn, James Craddock, the Gentleman Ghost, will seek to punish the world with the hatred he bears. James Craddock first appears in Flash Comics #88 (1947). DC Haunted #4: Deadman - Torn from the afterlife; a cursed soul seeks peace. If you're a Halloween fan, now it really begins, starting with the haunting and morose abiding of a restless soul as it attempts to find peace. Such is the curse of Boston Brand, the one and only Deadman, who stirs between the world of the spirit and that of the mortals. Forever a superhero in the eyes of the DC Universe, he is a being incapable of interacting with the physical until he possesses a host. Boston's story is one of greed, a big ego, and tragedy; once know as world's greatest trapeze artist, his life was suddenly extinguished in an act of murder, tearing his soul to send it reeling towards the abyss. Somehow, though, the goddess Rama found purpose for his existence, and a chance to find balance. Should he choose to help the weak and the helpless, he can move on to a benevolent afterlife. Now an aberration of the soul, Deadman lurks the shadows of mystery and divinity, finding those who need him most, never seen, but appearing wholly to stop and divert wrongful intent and malicious acts. His mission: to find the enlightenment, the one chance that harmony can become his before whatever ghastly spark of the spirit fades into the night. Boston Brand, the character ultimately fulfilling the undead shoes as Deadman, is a creation of the well-reknowned artist Neal Adams back in the 60s, who implied that the idea came from The Fugitive TV series. Basically, you take an assassination and try to find the true killer, except in this case, you're a ghost who can't affect the real world except through possession and paranormal means. (Does this sound like the movie "Ghost"? Well, now you know.) After the Deadman concept drew in fans, it became clear that plots of this nature were many, inspiring a superhero of intrigue and longevity. Deadman, Vol. 1 is a great introduction to Boston Brand's adventures and includes his origin story. It is comprised of Strange Adventures #205-213. And if you find this superhero inspiring, there's a lot more Deadman out there; he's had adventures with Batman, The Justice League, and multiple story arcs that include a grisly, paranormal twist. DC Haunted #3: The Phantom Stranger - I am the Phantom Stranger. And the Stranger comes...when the Stranger is needed. Study of the Phantom Stranger is difficult at best because his demeanor and style. The first problem is that he carries no true name; only aliases describe him as he has appeared over time (for example, The Grey Walker and The Brotherless One). In modern times, he is normally seen in a gentleman's guise with a three-piece suit, black-banded Fedora, and high-collared cloak. 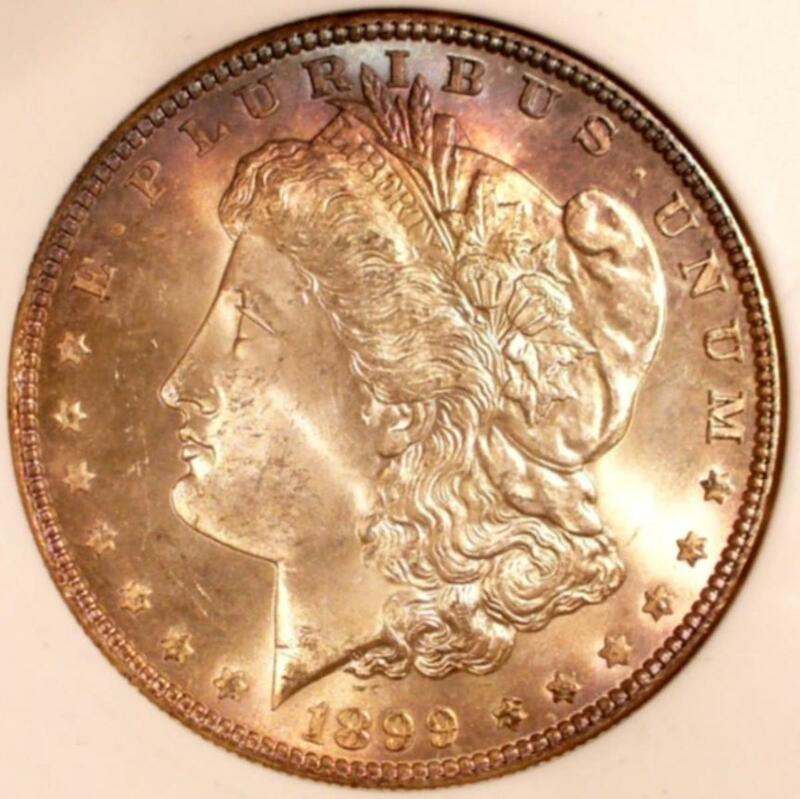 In most cases, his eyes are shadowed, but have been seen glinting white in the reflection of light. Whether ageless and immortal, or something entirely else, The Phantom Stranger defies the boundaries of life. Perhaps he doesn't even have a soul, but if that's true, his purpose becomes all too uncanny in the hours when we need him most. One of the many reasons to harbor an interest in the Phantom Stranger is his...strangeness. Yeah, that's right; he's one of those "dark" figures, like Batman, who never follow the normal rules, but instead show up in the last second unannounced. Ironically, it's hard to find a lot of Phantom Stranger collectible items. You can pick up his comics, when available, but other than that, you'll have to do a lot of searching to get a T-Shirt or otherwise. This is a 6 and 1/2 inch tall figure with multiple points of articulation. Adorned in his most recent, traditional garb, the Phantom Stranger wears his trademark suit, dark cloak, and black-banded Fedora., walking the dimension in search of those who need his assistance. 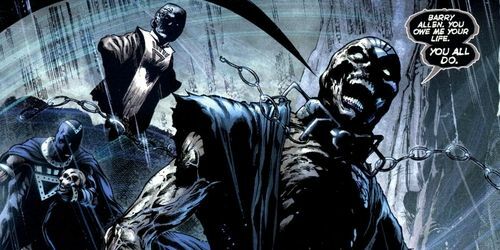 DC Haunted #2: Nekron - Because death...is such a spiritual experience. Amongst those spirits and entities fulfilling destiny, there is one horrid creature that continues to dwell among them, never seen, rarely felt, but unyielding and willing to destroy every living thing in existence. His name is Nekron, and is he nothing less than an elemental force of death, and therefore cannot be killed. From the chaotic, achromatic power he wields, it's obvious that Nekron would be an immortal enemy of The Green Lantern Corps (his first appearance was Tales of the Green Lantern Corps #2, June 1981.) He has tangled with other superheroes, but his appearance came from the mishap of Oan science, which released him from his dimension. Of recently, we are only spared a miserable end because Nekron is unable to sustain himself in our dimension. Without a link, he is unable to reach us. So far. Within the haunted universe of paranormal dimensions, we are mysteriously guided by beings of destiny and divine purpose. It is not uncommon for these entities to fulfill heroic or villainous designs; that is their nature. And of all these celestial creatures, the most recognized from DC Comics is none other than The Spectre. When he first appeared, back in More Fun Comics #52 (1940), the world was alien to this ghost-like apparition accented with deep, green cloak and trunks. He first adopted form was Jim Corrigan, a cop who was killed, thrown in a cement canister and dumped in the river. Unable to find peace, he was sent back to earth as The Spectre to exact revenge. Probably Jim was only meant for superhero fights, but that's all changed since the 40's; from then to now, his alter ego has evolved, adopting the role of a cosmic and eternal force of God. His powers are now unfathomable; he can do almost anything, and is thought to be immortal. To that end, The Spectre is now recognized as the primal Spirit of Vengeance; he is a true haunted spirit if ever one existed. His appearances herald dark retribution against those who commit murder and crimes against morality, and rarely does anything, or anyone, stand in his way. As you can tell, I'm a big fan of comic books and Halloween; this was just too good of an opportunity to pass up -- when you can bring the two together. So, if you have any comments or see something worth mentioning, feel free to drop a note. I also appreciate good criticism. I See Dead People - ...in comic books. @theoxingyi lm: That's an excellent idea. Thanks for mentioning that; it makes complete sense. I see that RSS is enabled on this page. You might want to suggest to your readers that they add your rss feed so that they can be reminded when a new spirit is added. Otherwise they are very likely to forget to come back even if they are interested. Cool page, though, I'm excited to get geared up for squidboo!